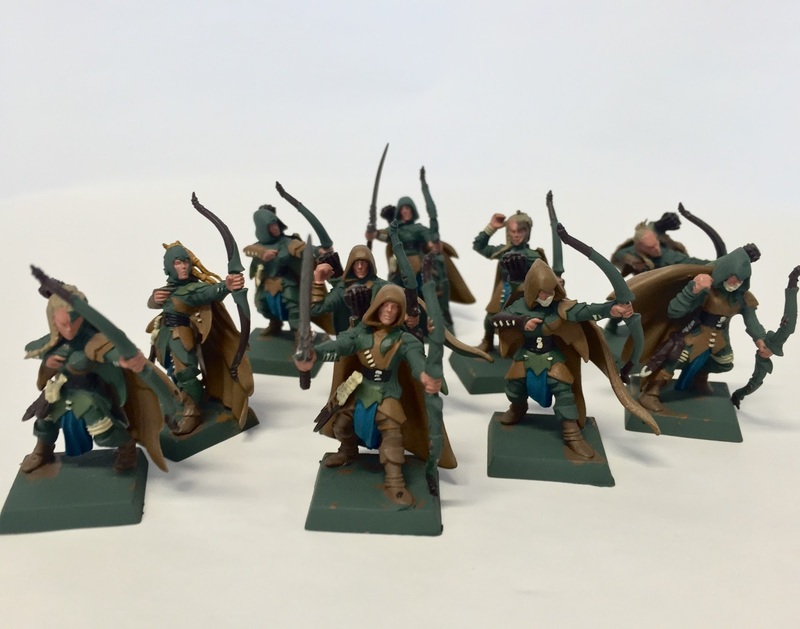 10 for Wood Elves main army and 10 for New AoS Warband. 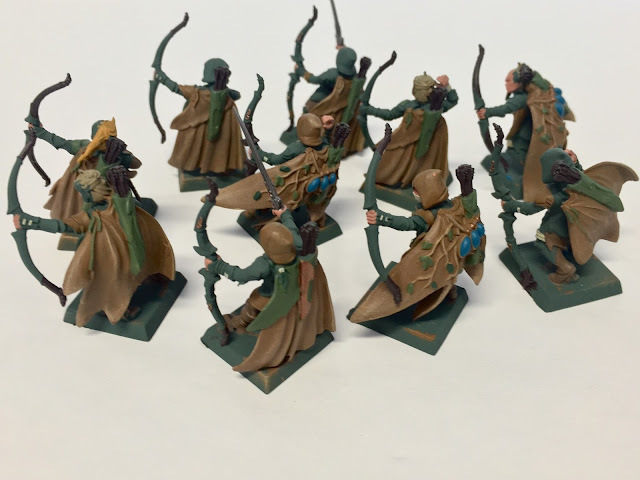 First on the list is the Glade Guard, I am creating a new AoS Warband that takes Warscrolls from different Factions. 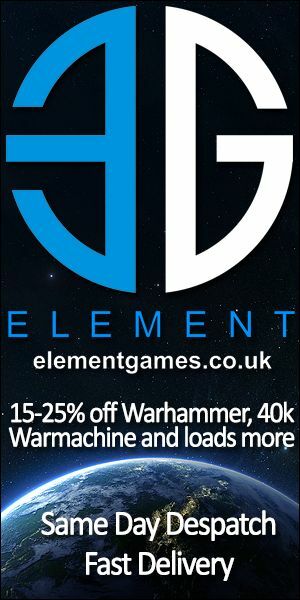 So as part of this I am modelling and painting 10 Glade Guard to be part of that. Because AoS doesn't specify that you have to take army's from the same faction, I have loads of unused models from different army's from 8th Ed that I would have never used.. but now I have an excuse to do it. 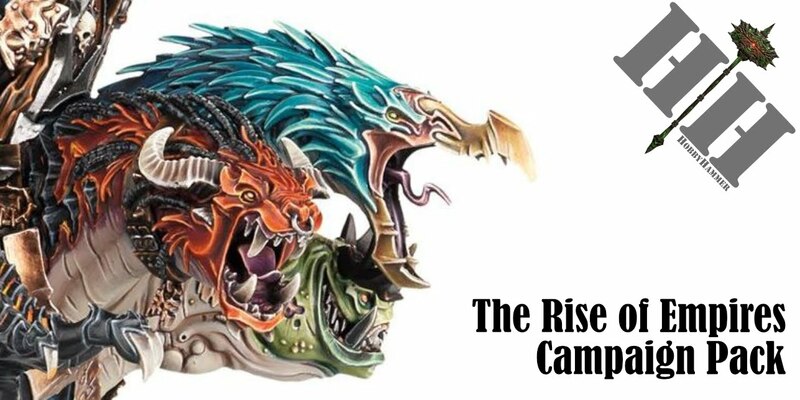 This army will be on round bases and will be coming from the Realm of Beasts. I will be doing a basing scheme that resembles a ruined temple in the jungles. Maybe an old unused Lizardmen Temple that my new war band will call home for now. 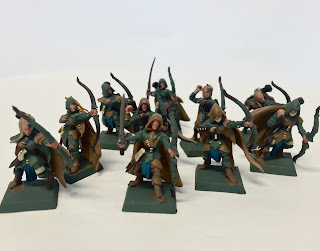 The other 10 Glade Guard are to go with my already 20 painted models I have in my Wood Elf army. 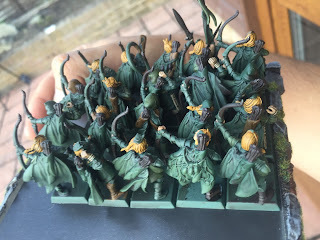 I have spray based the models green as the Wood Elf army is a speed paint army I am trying. This is the start of the AoS warband Glad Guard, I am trying to eventually get some cohesion between the different factions that will make up the war band, but at the same time distinguish them. I have painted the cloaks in XV88 and will give them a more leathery feel, I will also do this across the army. It is just a case now of randomly painting different areas slightly different Greens and Browns, so each model looks slightly different. The colour pallet is very small, I think there are only 4 main base colours used. I drybrushed the cloaks on the AoS models with a mix of XV88 and Ushabti bone. Gradually building up the tones. The skin was painted with Cadian Fleshtone straight onto the green base coat. 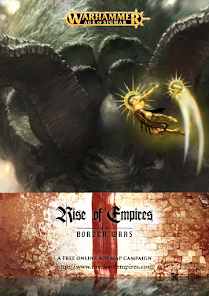 I then went round all the models picking out the details of stitching, swords, bow details and Sotek Green was used to pull each model into more coherency. 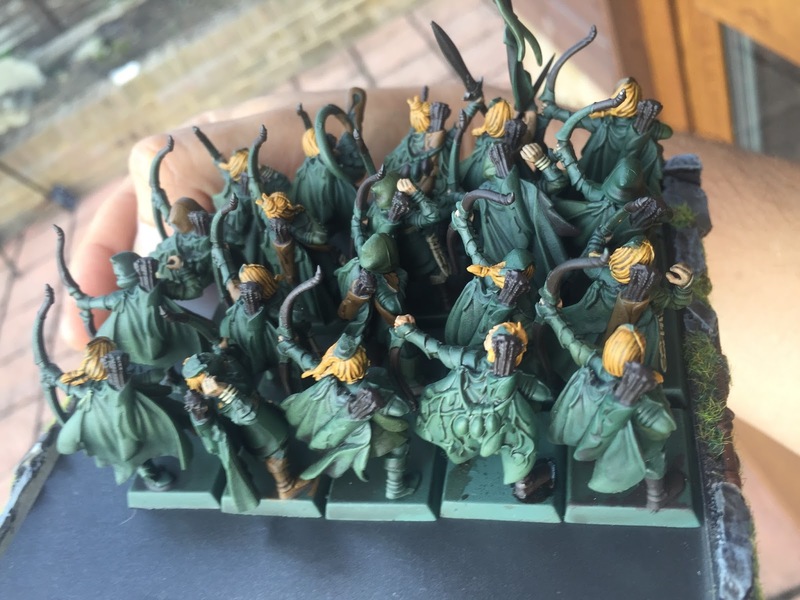 The reason I haven't applied any shade yet, is because like I said, I intend this to be a speed painted army and so wanted to leave that as the last step. There is something extremely satisfying about dipping models.. The final step was to spray some anti shine over the models and base them up. I have gone for a temple theme base using some resin round bases, but there will be a separate blog on this. which color primer did you use for your wood elves?